i’ve been having an interesting time spinning the same fiber as both roving/top and farm wool/commercial wool and was wondering what others’ experiences are. please email your answers to cosymakes (!at) gmail (dot!) com or respond in the comments section on this blog entry. need incentive? read all the way through this post. what have you spun in what preparation? 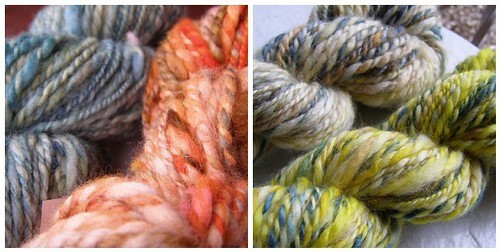 if you’ve spun both top and roving, which did you like better? were either of these farm wool? was there a notable difference between the farm wool and the non farm wool? elaborate or not as much as you would like! thanks for answering! when all is said and done, i’ll use the random number generator to send a lovely 4 oz. bundle of hand dyed roving at one participant and if more of you answer than expected, i’ll do two! so tell your fibery friends ;) and just as a side note, i may have to order the wool and dye it first, so the shipping of said roving may not be so prompt. heh heh. p.s. you may ask what i’ve been up to lately? labeling for the pittsburgh knit and crochet fest this weekend. i tell you, i’m boring. at least you all give me something to think about! This entry was posted in community, handspun, knitting, spinning by cosymakes. Bookmark the permalink. Although I am a relatively new spinner, I have tried both. And for me it all comes down to how it was processed. I just bought some roving from a local farm this past weekend that still has some VM in it. This will be spun up really soon as in this weekend. I have some commercial stuff to finish up first. A friend who has a sheep farm has clued me in to the fact that how old the sheep is makes a difference in how the fiber feels. But I like to try everything at least twice and sometimes three times.. I can tell you that I am finding that I like natural dyes best because they leave the fiber feeling softer in most cases. So far I’ve only spun 3 different things, all farm wool so I can’t state a preference. Though there has been some VM in these, some more than others, I’ve really enjoyed buying my fiber locally. I did purchase some commercial fiber at the MI fiber festival, but haven’t spun it yet. So far the corriedale has been my favorite, with my least being the alpaca. It was my first try at spinning, and I couldn’t get it to stick together. Also, I just got my roving in the mail from you, and it is even prettier in person. Thanks for being so speedy! I can’t wait to play with it. I have definately spun more roving than top, but I do remember very much enjoying the top that I spun. I liked how airy it was – I believe it was corriedale. Sadly I haven’t spun corriedale as roving so I can’t compare. corriedale Yes and all corrie is not the same. I haven’t tried any farm prep, but even rovings are not created equal. merino Lotsa lotsa merino. Roving, top. rambouillet yes! I had no idea how lovely this is. Only tried undyded roving (and it dyed awesomely). south african fine yes. Commercial roving. I have also spun Cormo from the lock, handcarded into rolags by me, and some exquisite pin drafted top. I think one of my faves EVER. I have 2 lbs of polwarth waiting for me to get it. It feels super soft and is a commercial roving. There haven’t been too many breeds that I’ve tried both farmy wool and commercially prepped wool, so I can’t say I can compare them very accurately. However, there are definitely a few breeds that I enjoyed and some that I have NOT. Apparently I am not a fan of fine wools like Merino, Rambouillet and S. African Fine. They have no character and spin like a big mass of cotton candy. blech. I can compare Romney from a farm and commercially processed. They really don’t seem like the same thing. The Romney top was really shiny, whereas the farm wool was more crimpy and less lustrous. Hello. I am a NEW spinner. :) The first wool I spun was fresh lambs wool, but the woman who washed it and carded it didn’t do a great job. Therefore it was greasy, and ugly once spun. I just dyed some Alpaca red and can’t wait to spin it, but I am trying to practice a bit before I start using the expensive stuff. Thanks for the chance… not sure if I qualify. As far as prep is concerned, I love it all. Carding by hand, spinning from the lock, minimally processed farm rovings, and super-combed top. It just depends on what I’m going for with my finished yarn. In general, though, my favorite things to work with are farm roving and hand-teased locks. I use top when spinning merino, generally, and have found a local source, organically raised (so excited)! blue-faced leicester – have spun from the lock, farm roving and commercial top. I don’t think there is any benefit to using the combed top versus the farm roving. The locks are long enough that minimal processing is still a smooth, easy spin. corriedale – i just taught a beginning spinning class and we used corriedale top…very easy spin. however, in my own spinning, i prefer to use corriedale in handcarded blends. shetland – this is abundant in vermont, but i find it too scratchy for next-to-the-skin wear. so, i usually get loose if i use shetland at all, and card it in to blend with other, softer fibers. falkland – never tried it! cvm – never tried it, but i want to! rambouillet – have used the loose locks, carded in with other fibers…spongy! romney – the fiber i spin the most. i get large quantities from a rescue farm and have it cleaned and processed into roving. i card it in with almost everything as an excellent base fiber. the farm roving is a little bit neppy, but i love the texture and it’s an easy spin. finn – never tried it! south african fine – never tried it! wensleydale – never tried it! alpaca is another favorite of mine, especially the long, lustrous suri. adds amazing softness to a handcarded blend, and there a tons of local alpaca farms here. llama seems to be hit or miss. As much as I love farm wool roving, though, I find it difficult to dye the fiber before it’s spun. It is so lofty and wispy that it felts very easily in dyepots, whereas top preparations are an easy dye. I notice that “top” and “roving” are often used interchangeably, but they are very different preparations. Almost everyone who offers hand dyed roving is really selling hand dyed top. I am sorry to say that I don’t pay attention to what sort of sheep the farm wool I get is. I really really love the fleece from baloo.etsy.com Otherwise I just collect and hoard whatever I can get. Farm wool definitely has more texture than commercial wool. The first thing I ever spun was Alpaca, which was a pretty unfortunate thing to start with. After trying really hard to get the hang of that for a while, I grabbed some sample size packages of what was just labeled “wool” from the LYS. It was very rough feeling and tough to pull apart. I’m not sure what it was. It was all in a blob when I bought it, too. I bought some south african fine from a seller on etsy, and I loooooved spinning it. I still haven’t spun it all up! The fibers pulled apart wonderfully and I was always left with a squishy, happy yarn at the end. I never know what to do with it when I’m done because I just want to look at it and play with it. I love it! Woodle – friend’s dog, in lock form, staple length shorter than I’d like, smelled like dog, didn’t love it quite so much. I’ve tried spinning fibre from a bag of sprinkle dyed and unorganized wool, but didn’t enjoy the effort required to draft, and didn’t like the clumpy yarn that resulted. Oh, and superwash merino – didn’t love it, not enough grip for my taste! I popped you an email w/ my response! Thanks for the heads-up via Twitter. I’ve spun quite a few different kinds and preps because I love to experiment. blue-faced leicester-I’ve spun this in roving and in top, and I like it better in top. The roving came from Spunky and the top came from Copper Moose so neither were farm wools. corriedale-I’m currently spinning corriedale pencil roving from Crown Mountain Farms. I love it. The price is amazing and the prep practically spins itself. shetland-have not tried but want to. merino-roving and top, superwash and not. I like the non-superwash in roving form best to spin, it’s much easier to control that way. Although top (more properly, commercial sliver) gives you a very nice lustrous worsted yarn. cvm-Spun a small batch of this in roving form-very nice to spin, wanted to be a woolen yarn. It was farm wool that I got in a destash. It was easy to spin and pleasant on the hands. romney-done top and roving in this. I prefer top. wensleydale-have done top, (sliver) and love love love it. I love longwools best, I think. I’m planning to hand-card some blended with silk, if the samples work out okay I may do a skein or two that way. I’ve also done cotswold, farm wool dyed in locks from Sheep Shed, and enjoyed spinning that both directly from the lock and carded. I have also tried cotswold roving but it was a bit more difficult to manage than the locks and rolags. I’m still pretty new to this but it’s a pleasure doing all sorts of experiments to see what works best for me. Oh, I’ve also done alpaca from roving and from handcarded rolags, and from loose fiber, yak from rolags and loose, and cashmere from a cloud. The rolag/loose alpaca is a small farm product, I still have about half a pound of it waiting for the right mood. I have some loose camel fiber in the fiber stash but haven’t tried it yet. I’m thinking an alpaca/yak/camel sweater, specifically that feather and fan cardigan that was in IK last year. But I keep putting it off to spin more sock yarn. Generally, prepping a fleece yourself will yield you the nicest fibre because it’s all from the one animal. Commercial top is a combination of the fleece of so many animals, and since quality and diameter vary from sheep to sheep, you’re getting a mix of the best AND worst. Farm prep, from their own flock, is great stuff because it’s fibre combined from only their (usually well-cared for) flock. I’ve tried farm cormo roving, and some farm merino/alpaca blend roving, and loved spinning it woollen right from the roving, no additional prep needed. However, when I buy hand-dyed wool, I prefer to buy commercial top. My experience is very limited at this point, as you know. But I just have to say your shetland was really great for me to spin, I haven’t tried the corriedale yet. I have some rambouillet that I need to card to use, but I haven’t spun any yet. Honestly, I still get a bit confused about what is top versus roving. Much of the stuff I have bought is from Pigeonroof or Funky Carolina, and they seem the same yet one calls it roving and one calls it top. From what I’ve read, I think I technically am spinning top. 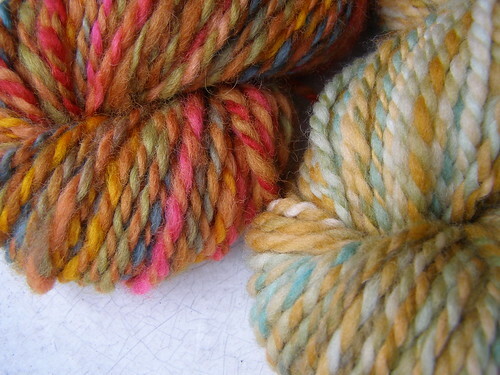 I’ve also spun from hand-carded batts and love that experience. I have noticed a pretty big difference between farm prepared roving vs commercial prepared. The commercial ones have most of the crimp taken out and are a lot smoother to spin and almost no lanolin. I prefer the smoother ones overall. I’ve enjoyed all of these, though I found some of the corriedale, shetland, and the adult alpaca to be too rough for my tastes. The locks were great to spin–but combing them into clouds was soooooo tedious! It was, however, worth it for the resulting lush softness. The cormo is from the same farm (Martha’s Vineyard Fiber Farm), and is an absolute dream, just beautiful. The commercial preps are all fairly similar–not too slippery, but not felted at all (depending on the dyer, of course–I’ve got my sources down now, so no worries there for me). The BFL and Falkland have less grabbiness and thicker individual fibers than the merino or other wools. This makes for a less poofy and slicker yarn, as well as less yardage than the merino or Rambo/Targhee spun the same way. I am a fairly new spinner so I’ve really enjoyed reading about everyone’s experiences with different spinning fibers and preparations. -Merino – Super soft and a pleasure to spin, I sometimes have trouble spinning an even yarn with it. -Corriedale – I have also found there really is a wide difference in the softness of this wool. Some of the nicest and the coarsest yarn I have spun is corriedale. I am spinning some up on my spindle, now and it is lovely. -BFL – I have really enjoyed spinning this yarn the look and feel of it is wonderful. I try to get my hands on a variety of different fibres and from many different places. My favorite is from a family friend’s sheep. She does most of the shearing, washing, sorting etc. but sends it away to a woolen mill to become roving or yarn. Its Cotswool but amazingly soft & springy. blue-faced leicester – Commercial top, I found a huge variation depending on where you buy it. rambouillet – not yet but can’t wait to. I have also spun commercial top alpaca, silk, bamboo, flax (in a blend) & tencel.